Lithocrete® is a patented architectural concrete paving system that utilizes the structural properties of reinforced concrete, combined with the aesthetic quality of surface-seeded select aggregates. Belarde Company is the premier licensee in Seattle and the Pacific Northwest. As award winning professionals, our skilled craftsmen are specially trained to provide the highest standards of quality and service to the most discerning architectural concrete projects. Limestone, terra cotta, slate, tile, brass insets, etc. As an exclusive installer of Lithocrete®, Belarde Company ensures work will be performed by licensed craftsmen who are qualified and experienced in the installation of this unique paving finish. In the past, keeping small ASR (Alkali Silica Reaction) or “reactive” aggregates embedded in the surface of concrete paving was difficult. However, Lithocrete’s patented innovative paving process permanently bonds “reactive” as well as “non-reactive” aggregates. Lithocrete’s patented sealer, Lithoseal®, significantly reduces the reactive condition that may exist between cement and aggregate. Lithocrete® paving is superior to veneer-type paving finishes such as granite, slate, tile and brick because the process consists of a single, structural monolithic pour. Delamination of the paving surface is non-existent, thereby giving a substantial longevity and reduction of future maintenance costs. 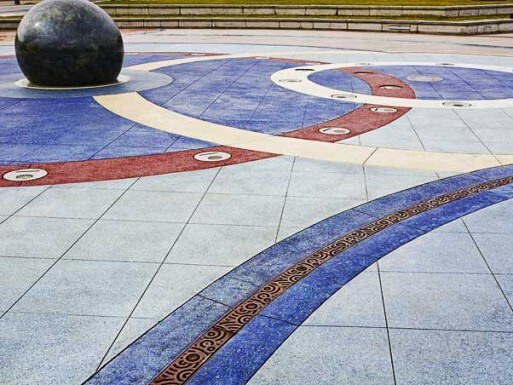 What’s more, Lithocrete® is environmentally conscious in using recyclable materials.